"I'm so jealous!! You can actually emboss!!! HOW DO YOU DO IT??? I've used every kind of stylus I know of and my images never POP like that!!! I usually end up tearing the paper trying to get my images UP!! Any tips/pointers would be much appreciated!!" Turn on your light table and put your classy brass stencil on top. 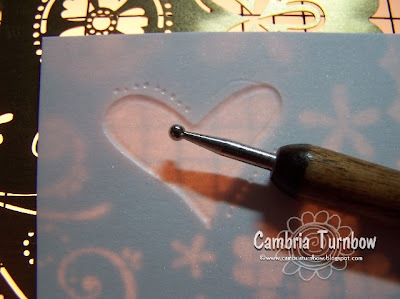 Lay your paper over the image you want to dry emboss, on top of the stencil. If you want, you can use wax paper and rub it over the top of your paper to make your stylus slide easier. I used Shimmery White card stock and didn't have a problem. Use the big ball end of your stylus for the big portions or outlines of your image. Go around the edges pushing against the stencil. Use the small ball tip to get the little circles or in smaller areas. Try to stay within the template area, but if you go outside a little, most of the time it won't show on the other side. Turn your paper over and SHAZAM, you've dry embossed!! Hope this helps!! 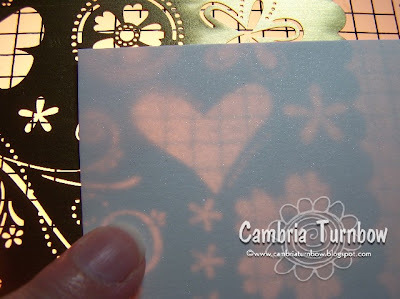 Now, let's see your dry embossing creations!! You have been tagged!! Here are the rules: Post seven random things about yourself. Tag 7 other bloggers Post the rules. Leave tagged bloggers comments on their site. Have Fun! Thanks for all of the inspiration you provide - you rock! Your work is so beautiful! I just ordered the Priceless set...now I have to get the template as well! I just started dry embossing, and the only template I have is Seeing Spots. There are just too many things to buy! Well duh! I also tear my paper and can't get the hang of this! 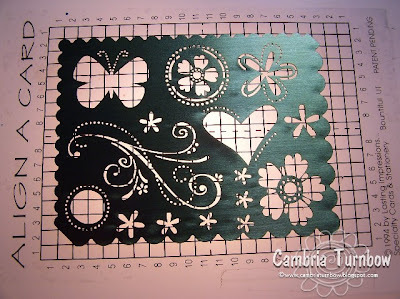 I will have to practice when I get my new stencils with my SU order. I am sure missing my daily dose of Cammi stamnping!!!!!! Janome Sew Mini On Sale Again! 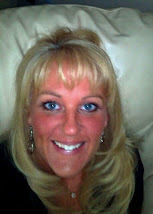 I LOVE Lizzie Anne Designs!! !